Another day...another Happy Dance!! Paganini is moved up to star status!! I love how it turned out!! Paganini is a Schnibbles pattern from Miss Rosie's Quilt Co. by Carrie Nelson. It was the October Le Petite project from last year. All fabric is from French General. It took me 3 times to get the quilting right on this little quilt. I frogged it twice!! There were more holes in this than Swiss Cheese! LOL! I did all the feathers and feather wreaths freehand. I used a ruler to to stitch in the ditch and make the the little diamonds in the centers. I was able to practice some new techniques. Stitching in the ditch and using a ruler on the LA is pretty hard work, but I loved every second of it!! I love how the quilting made it look like trapunto. Three was the magic number. I'm glad I didn't settle with other quilting because this design was the best for Paganini. I gave it a wash yesterday. Big difference from before quilting!!! Wow. Just the design help I was looking for. 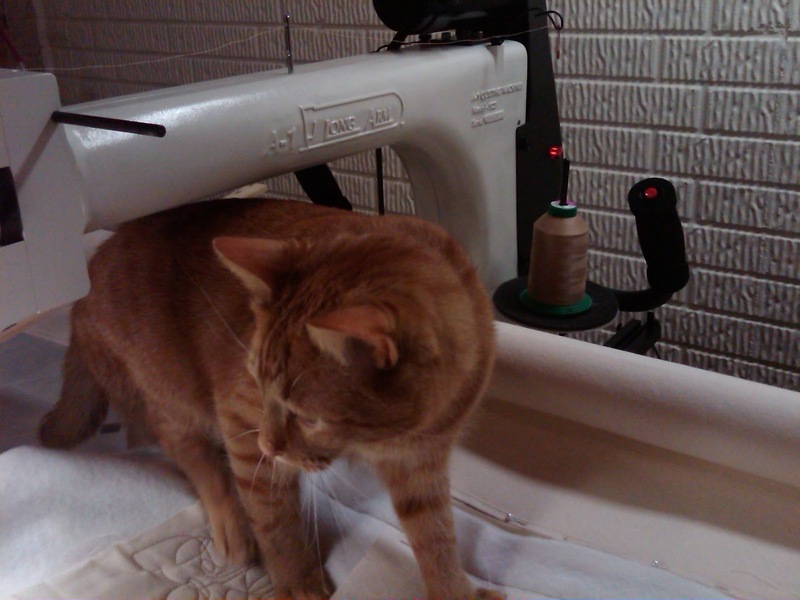 Oh and he thought he was certified to longarm quilt too. Bea-U-ti-FUL!!!!!!!!!!!!!!!!!!! Love your helper...we all need a little help from time to time...glad Sarge didn't decide to help...LOL! Fantastic! I love how you have quilted this. You are so right, quilting really does make the quilt. Love your helper. I miss my kitty so much. Just gorgeous and the quilting is perfect to show off this beautiful quilt , love the scallop border that adds such a nice touch . I can't wait for you to get your hands on mine. Gorgeous - your quilting really makes the quilt come alive! I have Paganini on my to-do list. The scallop border makes such a difference in the quilt. 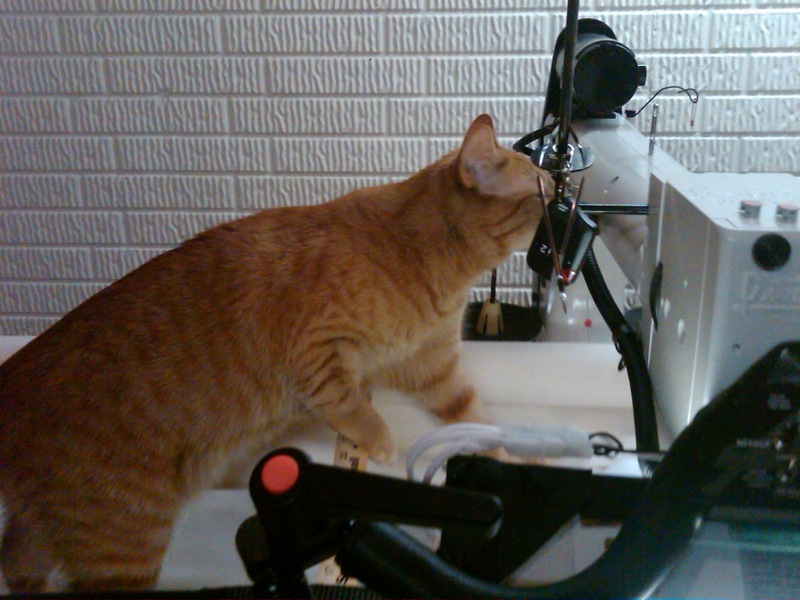 And, of course, the quilting. You are good at that. That turned out beautiful! Love the scalloped edges. Gorgeous! 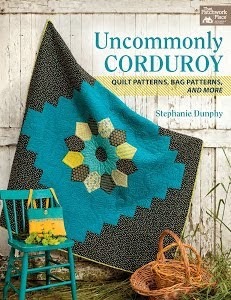 I love the scalloped edges and your quilting.....wish I could hit the pause button on life and make one today! Your little helper looks just like my daughters Gurty who would be doing the same thing if she lived here. Gasp! It's absolutely stunning! I love what you did in the centers of those blocks. I love the trapunto look, too! And scalloped border is perfect. I love how you quilted it. How could I ever be disappointed with what you do? Silly girl. I really LOVE this! I may bring you my flying geese one, too! LOL. Then I'll know I'll love the quilting. We'll see. I sorta want to quilt it, but would love consultation from you on the design! Oh I just love that pattern too. You really crank these things out. I've been stuck in a rut lately. So nice that your hubby helps. Is he a quilter too? 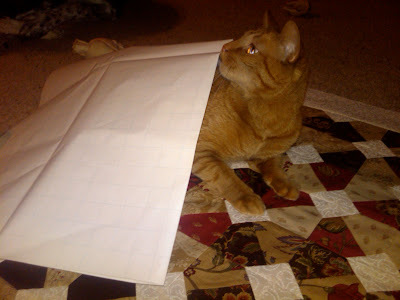 My husband helps out with things I need for my quilting. What a champ! I really love French General fabrics and I love, love the backing!! I absolutely love the diamonds in the middle! And of course the feathers, but we knew that. Great job! If the contacts work, let me know what brand. I swear I've tried them all but I have hopes that there is a perfect pair for me out there. Stunning, Linda! Scooter is a cutie! I have always wanted to do a scalloped border! I need to challenge myself to tackle that one of these days. Your quilting is lovely Linda. I see greatness coming your way in the world of longarm quilting, Linda! How very cool that Scott made the scalloped border, too! Maybe Scooter smelled Rosie in the pattern (wink)! Lovely! The scalloped edge really sets of the center nicely. Quilting always makes such a difference, it came out beautifully. Fantastic! I love what you did in the little white diamonds. Another beautiful finish! 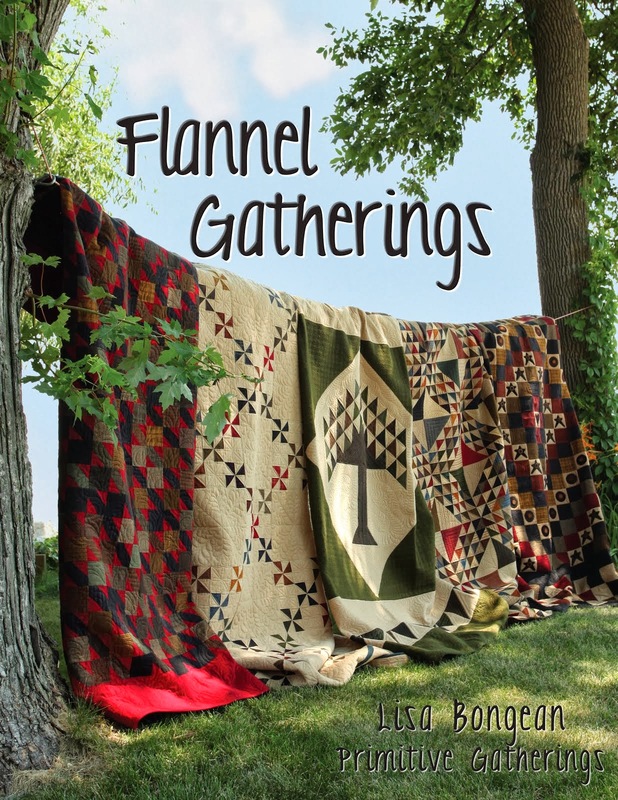 Your quilting is gorgeous and perfect for the quilt. Gorgeous quilt!! Love the scalloped edges. Scooter is a wonderful longarm quilter lol! That is STUNNING. I love how you scalloped the edges too. 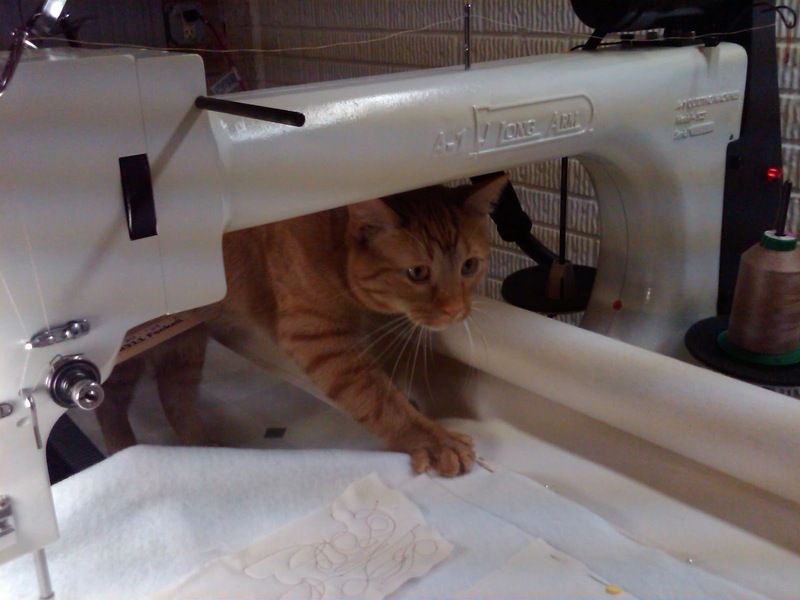 When are you going to start entering your quilts in shows? Wow, wow and wow!!! The scalloped border just brings a whole new look to Paganini (one I haven't done yet) and the one-sided feathers in the border are perfect! Looks like you could hire Scooter - he really looks like he knows what he's doing up there - LOLOL!